Diane Lapson, center, president of the Independence Plaza North Tenant Association, joined elected officials at a press conference Aug. 16, 2012. TRIBECA — Elected officials pledged their support Thursday for the embattled tenants of TriBeCa's Independence Plaza North, who are fighting for their apartments to become rent-stabilized. The officials — including Borough President Scott Stringer, State Sen. Daniel Squadron and Council Speaker Christine Quinn — recently filed court documents arguing that the 1,331-unit complex, which was built as affordable housing but now commands luxury rents, should be rent-stabilized because owner Laurence Gluck received a tax break. The tenants have been battling Gluck in court for the past seven years, and while an initial 2010 decision favored the tenants, the state Supreme Court's Appellate Division ruled in Gluck's favor last April. Now, the tenants are asking the state's highest court, the Court of Appeals, to hear their case. "These tenants deserve to be heard," Stringer said outside Independence Plaza Thursday morning, surrounded by dozens of longtime residents. "The state's highest court represents the last hope…for the tenants of Independence Plaza North." Stringer, along with dozens of elected officials and housing advocates, signed onto amicus briefs, or legal papers, urging the Court of Appeals to give the tenants a chance to make their case. The tenants argue that IPN should be rent-stabilized because Gluck received a J-51 tax break, which is given to landlords to make improvements to their buildings in turn for providing rent-stabilization. But Gluck says he canceled the $7,550-a-year tax break in 2006, so he does not owe the tenants anything. Longtime IPN tenants currently have some rent protections, but many pay more than they would under rent-stabilization. New tenants pay market rate, with one-bedroom apartments going for $3,650 to $4,500 and two-bedrooms renting for $4,750 to $6,500. Stephen Meister, a lawyer representing Gluck, said the state's Appellate Division made the right decision in support of Gluck last April. "No amicus brief can change that," Meister said in an email Thursday. 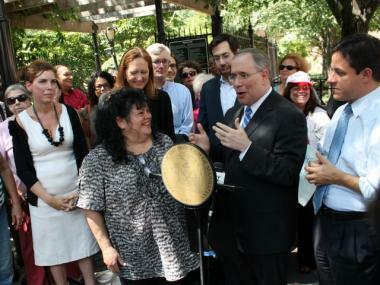 "Regardless, the tenants remain protected by the generous landlord assistance program." Even if the Court of Appeals agrees to hear the tenants' case, a final decision could still be a year and a half away, Stringer said Thursday. Diane Lapson, president of the Independence Plaza North Tenant Association, said that while the tenants are tired of waiting for a ruling in their favor, they will not quit. "The only way we can accomplish what we want to is to continue to fight together," Lapson said. "I urge everybody to not give up just because things get difficult, because that's how great things happen."